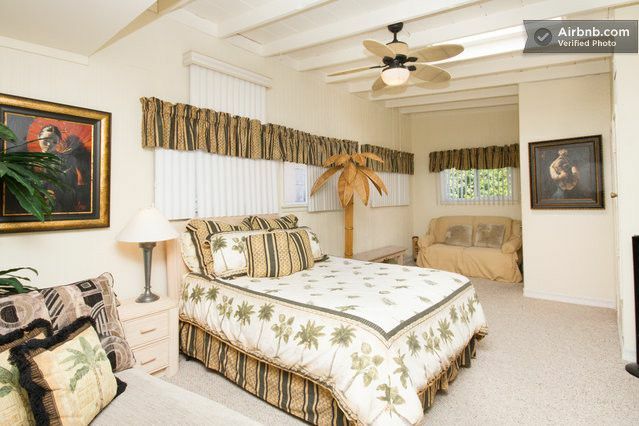 Great Vacation Rental Located in the Middle of Downtown Laguna Beach. Situated Above the Village Gallery - Right Across the Street from Main Beach! Beautiful Inside - Gorgeous Kitchen, Spacious Master Bedroom. One King Bed, Two Full Beds, and a Queen Sofa Sleeper. the Walls Are adorned with Beautiful Paintings from the Gallery Below. Nice balcony to watch the ocean sunsets and the world go by. This is a Great Vacation Property! Off-Street Parking. Park your car and walk to everything. Laundromat with excellent wash and fold service less then a block away. You Can't Get Any Closer to Town!!! Sleeps 6-8. Beautiful Laguna Beach location. Right above Village Gallery and in the heart of the town. The Village Gallery features the artwork of Fabio Napoleoni, Michael Godard, Fabian Perez, Thomas Kinkade, Steve Barton, Frogman, Steven Quartly, Sam Park and many other popular artist. We are celebrating our 40th year in the art business. This is a very spacious apartment upstairs from the Village Gallery. Right in the center of town near Main Beach, Great Dining, Shopping and near the Festivals. We are located on South Coast Hwy above the Village Gallery between Laguna Ave and Legion Ave. You can walk to the beach, restaurants, shops, the arts festivals and grocery stores. The only done side was the air conditioning was non existent out side the master bedroom. There were a couple of nights that sleeping was not possible. I don't remember the conditions being like this in the past. Another issue is that the refrigerator didn't keep the food cold. These are the reasons for the 3 stars. I really like the place and in the past it was perfect. This would be 5 stars easily if the two items above are addressed. Sorry Scott I did not know of any problem with the Refrigerator. I do have an AC unit in the front and was not aware it was not working either. I will look into it. We loved the size and location of this condo. The kitchen has also been updated, and is great for fixing meals from our kiddos and visitors. The one draw-back is that the AC is not central, but one window unit in the master bedroom and two standing units. The only unit which worked was the master bedroom unit, so the kids ended up sleeping in there with us due to the heat. There is a nice cross breeze that makes it comfortable in the rest of the condo during the day, but not enough for comfortable sleeping at night. The temperatures were high because we stayed in late July and August. It's probably very comfortable other times of the year. We would definitely return in cooler months, or if the AC units worked in all of the rooms. Centrally located - roomy and fabulous kitchen. We so enjoyed being with family and friends. Gallery downstairs is outstanding!!! Hope to have the opportunity to visit again. a great place to stay in Laguna Beach! We had a wonderful stay at the "Penthouse" for Easter. Perfectly located, spacious, and very comfortable. We will gladly stay there again in future. Walk to everything! The location of the apartment is perfect! Easy access to many great restaurants and shopping,and an incredible view from the balcony. The apartment it's self is very comfortable with just about everything you could need. Rates are subject to change. No third party checks.